T3 Awards 2016: who's nominated for Camera of the Year? The camera industry may be struggling against the rise of smartphone cameras, but even the best smartphone isn't a patch against the entries in this category this year. Indeed, these cameras are connected, take amazing images and give you unprecedented control to be as creative as your eye and imagination allow. Of course, there can be only winner of T3's prestigious Camera of the Year award, and these are the super snappers in contention. Which camera would you give the award to? "This camera is incredibly attractive. It's based on Olympus' classic Pen F range from the 60s, which is a design icon in itself.Despite its retro looks, the Pen F is packing the lastest imaging tech. That includes a brand new 20MP sensor without a low-pass filter (for that extra sharpness), and 2.36 million dot OLED electronic viewfinder. It has the latest True Pic VII processor and can shoot at 10 fps." Nikon continued to push what a DSLR can do with this high-end, 20-meg/4K semi-pro camera, which offers 10fps bursts. The build quality the camera delivers is also just superb, with a robust metal, weather-sealed body, while the ability to have photos automatically transferred to a smartphone incredibly conveniant. Another strikingly fine Canon PowerShot, this top picture taker added an EVF to the usual mix of manual controls, great lens and large sensor. Indeed, that 20.2 Megapixel CMOS sensor, in partnership with a DIGIC 6 processor, optical image stabilizer, electronic viewfinder and built-in Wi-Fi means that this compact offers enough power and features to take on bigger, more expensive DSLRs. Can it take them on and win? "The newest model in the range, the A7R II, is a corker. With a massive 42-megapixels, it's perfect for landscape and portrait photography. The body is compact and wether-sealed, and the video capabilities are brilliant. The big two should be worried." As too the other finalists! 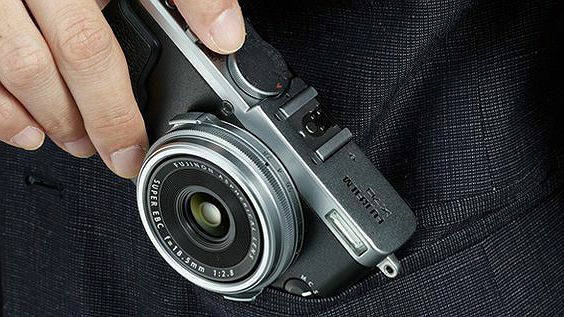 "The FujiFilm X70 is the lightest X-series camera with an APS-C sized sensor. The top-plate features milled aluminium exposure compensation and shutter speed dials, making it easy to quickly access key features, while the aperture and focusing rings are also made from milled aluminium to help keep weight down." And last, but no means least, is the impressive Panasonic TZ70. Offering a 30x Leica zoom lens, viewfinder and manual controls, this inexpensive and handsome travel camera is BA quality at a Ryanair price.